Around 9.15 a.m. on 23 October 1915, a German torpedo slammed into the transport ship Marquette as it entered the Gulf of Salonika in the Aegean Sea. The ship sank within 10 minutes, leaving hundreds struggling in the water. By the time rescue craft arrived several hours later, 167 people had drowned, including 32 New Zealanders (10 women and 22 men). Among those who died was Mary Gorman, whose body was never recovered. Born in Ōamaru in 1880, Gorman trained in nursing at Waimate hospital before moving to Wellington hospital in 1911. She enlisted on 19 May 1915, just two days before leaving Wellington on a troopship. Gorman and her fellow nurses travelled via Sydney to Port Said in Egypt, and joined the No. 1 Stationary Field Hospital. Many of the wounded soldiers from Gallipoli were sent there. There are 65 tents, and each tent takes eight patients … Twenty-nine New Zealand nurses have arrived, and their help was invaluable. During six weeks 700 patients had been admitted. In early October the staff were notified that they would be moving to a new location. On 18 October they packed up their equipment and departed by train for Alexandria. At about 3 a.m. the next day they boarded the Marquette, a 7057-ton steamer. A cargo ship in peacetime, the Marquette had been converted into a transport for wartime service. the happiest and most peaceful … I have ever known at sea. It was calm and sunny and everyone was so well … No. 1 New Zealand Hospital very much felt the honour that had been conferred upon it by being sent to so important a field. There were rumours of torpedoes, of course, and we had lifebelt drills for two days, but we really hardly took it seriously I am afraid. The Marquette was escorted by the French torpedo destroyer Tirailleur, but this left the transport on the evening of the 22nd for reasons which are unclear – possibly to aid a disabled transport ship. This did not cause much concern as the Marquette was expected to reach Salonika by midday on the 23rd. At 9 a.m. on 23rd October … I was on the top deck of the Marquette walking with Captain Isaacs and Sister Sinclair. The morning was cold, and we had our coats on. He exclaimed: ‘I wonder what that is coming toward us.’ I said: ‘It looks like a torpedo, does it not?’ Surely enough the crash came then, and we realised what it was (it was just a straight, thin line in the water and the swish could be heard distinctly). I should think it was only about fifty yards away when we saw it. It is not known exactly how Gorman died. Another account had it that only her legs were crushed, and she gave away her lifejacket because she knew she would not survive. It was awful going past the ship and seeing a large, gaping hole, and all the mules there, and wondering if the vessel would fall on top of us and I would be killed. At last we got past her propeller, to which some men were clinging. We floated with boards, lifebuoys and anything we could catch hold of, for seven, long hours … When I was getting tired, [he] sat on a board and rested me across his knees. Then he would put his arm across a board and let me rest my chin on his arms. He helped others in this way as well. It was dreadful to see some of the other men going whitey-yellow and then blue around the nose, mouth and eyes and, a little later, passing out. One man, who died early in the morning, floated with us all day. I only saw one sister in the water the whole day. I swam about for hours … feeling very sick and sore … I saw some men hanging on to wreckage, and called to them to ask if I might also hang on, and they said it was no good, there were already too many there. Then one of the crew saw me and came along to me with a piece of board, to which I clung for some time. Then he said to me, ‘Look out, Sister, there is a shark right behind you; paddle for your life.’ I did so, though I’d rather drown than be eaten by a shark … My rescuer died soon after this from cramp or exhaustion. I was sorry I could do nothing for him … I wondered if I should be the next. Men died on all sides. Some lost their reason and went away from us all. We could see ships pass and repass in the distance, but they took no notice of us. They could neither see nor hear us, but we thought that because they were neutral they would let us die! … Luckily for us our own English patrol boat … caught sight of one of our boats in the distance … Many died even after the boats were in sight; it seemed too much for them. One of the four nurses still on board when the Marquette sank was Mabel Wright from Southland. Wright saw Isabel Clark and Marion Brown turn and speak to each other before holding hands and jumping into the sea. They did not survive. The Marquette sent out a faint SOS immediately after it was hit. It took no more than 15 minutes to sink, but survivors spent up to nine hours in the cold water. They were rescued by the British destroyer HMS Lynn and the French destroyers Tirailleur and Mortier. 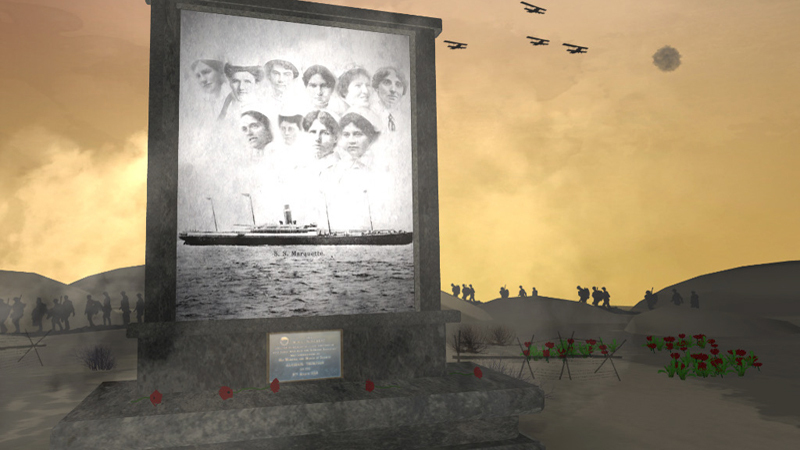 Of the 741 people on board, 167 lost their lives, including 10 New Zealand nurses and 22 men from the New Zealand Medical Corps and No.1 Stationary Field Hospital. Of the nurses, only the bodies of Margaret Rogers and Helena Isdell were recovered. They were found together with the bodies of four soldiers in a boat which washed up near the Greek town of Zagorá. In view of loss of ‘Marquette’ my Government would be glad if arrangements could made whereby medical units, such as stationary hospitals etc. should when possible be transferred by sea in a hospital ship. The sinking of the Marquette was widely reported, but accounts conflicted. One popular story was that the nurses had refused to leave until most of the fighting men were off the ship – they had 'stayed on the decks cheering the Tommies'. Lieutenant-Colonel McGavin, commanding No. 1 New Zealand Stationary Hospital, wrote to the Defence Minister to refute this notion: ‘I myself saw that all the nurses were clear of the ship.’ Nurses wrote to the nursing journal Kai Tiaki to deny both versions: they had not cheered and deliberately stayed behind, nor were they all off the ship before it sank. Of their conduct as a whole no words can express our admiration. They mustered quickly and quietly at their alarm post and cheerfully and without the least confusion or panic passed along the deck to their boat, and never once during the long day did I hear any of those who were able to stick it out make any complaint.